Leading into the second Test against Bangladesh, you'd be forgiven for thinking there was no cricket on at all. Club cricket has had a sputtering start, interrupted by icy wet Spring storms sent from Antarctica. The domestic first class season hasn't got underway yet. And to top everything off, there's a home All Blacks Test this weekend. So who gives a monkeys about the Blackcaps playing Test Cricket in Bangladesh right now? It's not in our time zone, and it starts around 430pm NZ Time. You'd be mad to be up all night watching it on the sofa in your snuggle sack , with your hot milo and vogels toast wouldn't you? Well yes, you probably would. And then there were all the discussions about the spin bowling. The spin bowling that was like an unravelled ball of wool. Going nowhere and not turning. There were very few highlights from the bowling unit from that match in fact. We did see some nice work with the bat from Kane Williamson though and he keeps going from strength to strength. 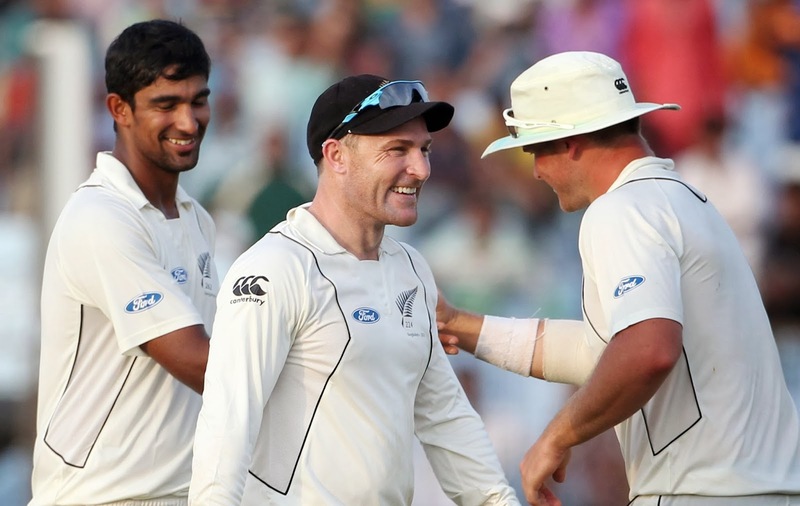 The fielding was also consistently good, as we have come to expect from the Blackcaps. So, onto the next match and time to start thinking about that vogels toast and the milo, and reserving a spot on the sofa for the snugglesack. The next Test is in Dhaka and starts on 21 October, after the Eid holiday break. What changes can we expect to the lineup? Well, the fact that Ross Taylor had a bowl tells me that (apart from some creative captaincy there) we need to review the bowling attack. Dhaka will be a different pitch and will likely have slightly different conditions, but you'd have to think that Southee or Wagner are going to get a turn. They must both be like a pair of hungry greyhounds, straining at the leash and more than ready to race after that rabbit. And they will keep on racing, until they drop. As for the spin- we don't have too any options there. If it's a flat deck, it's a flat deck. Although, Bangladesh had more success than the Blackcaps in that department. We have Martin and Sodhi on tour, but there is no mountainous reserve of good spinners all clambering over each other to get to the top. Vettori is rumoured to be on the way back and about to play a couple of early matches for Northern Districts. But we should stop pinning all our hopes on his eventual return. Lets face it- it may never happen. We need to get behind the spinners we have got and give them the support that they deserve, and in fact need. I think Brendon McCullum will go with mostly the same lineup for the rest of the team. We've heard him talk before about consistency and giving the guys every chance to prove themselves. He doesn't take a single match as a trend, and nor should we. I look forward to McCullum's moves in this next match. His declaration in the last Test was another sign of his aggressive approach and it's clear that the BlackCaps are there to win. Lets hope that this time they can get it across the line. Before the milo gets cold!